UCW students recently gave back to the community. Twelve students volunteered their time at the Salvation Army’s Belkin House, which provides services and meals to those in need. The group from UCW helped clean up the place, as well as assisted with preparing and serving meals to more than 100 people. 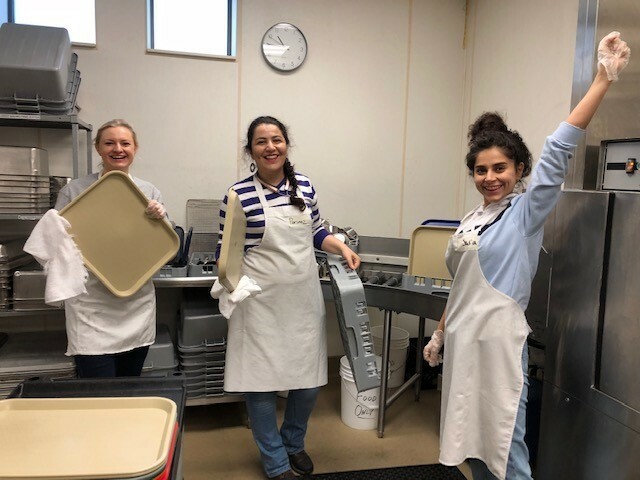 "Participating in the Salvation Army volunteer event was such a great experience for me,” said Tatiana Buldakov, a UCW MBA student from Russia. Rodolfo Motta, who took part in the event and is part of UCW’s Student Services team, described the event as a learning experience for everyone involved. “Students learned not only about the importance of the work they were doing, but also the benefits of volunteering and giving back,” he said. Rodolfo added that the experience also enabled UCW students to develop their customer service, communication, interpersonal and teamwork skills, as they interacted with other volunteers and those in need. “We're developing a relationship with Belkin House so UCW students, staff members and the institution itself can continue giving back to our community,” he said. This isn’t the only recent volunteering event for UCW students.Last term, a number of students volunteered to take part in the Great Canadian Shoreline Cleanup. They spent a hot summer Saturday morning cleaning up around False Creek in downtown Vancouver. The Great Canadian Shoreline Cleanup is a nation-wide event. Volunteers coordinated 1,362 cleanups and collected 49,043 kg of litter on 1,672 km of Canadian shoreline. These sorts of volunteering activities have become a regular feature of the student experience at UCW. University Canada West is a business-focused university in downtown Vancouver, BC.. UCW offers Master of Business Administration, Bachelor of Commerce, Bachelor of Arts in Business Communication and Associate of Arts degrees, as well as preparatory programs. For more information about applying email info@ucanwest.ca.